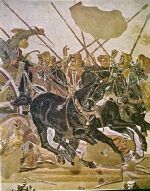 This opus of a mosaic is a verisimilitude in depicting a battle between Alexander the Great and the Persian King Darius, probably the Battle of the Issus River, which occurred in November of 333 BC. 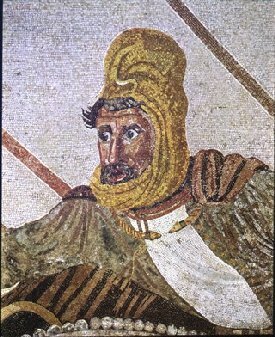 With over one and a half million tesserae, none larger than 4 mm., using the four colors of white, yellow, red, and black. 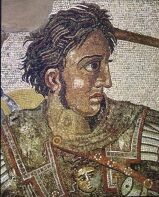 The minuteness of the tesserae enabled incredibly fine detail and painterly effects, including remarkable portraits of Alexander the Great and King Darius. 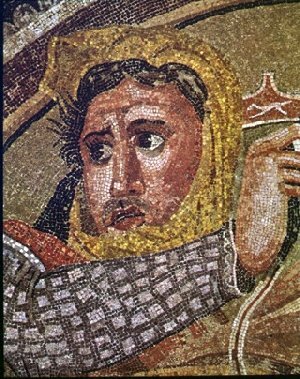 The border of this huge mosaic consists of large stones in a dentate pattern. In the corners are rosettes. Within the border along the bottom of the picture is a blank brown stripe, which some consider to be part of the picture, balancing the white expanse of sky at the top, while others argue that it is simply part of the frame. The composition of the mosaic is dominated by the two protagonists. On the left is Alexander the Great and on the right is King Darius. 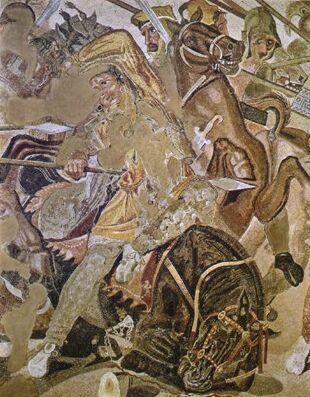 With Alexander appear his helmeted Macedonian soldiers, although little remains of them due to damage of the left side of the mosaic. 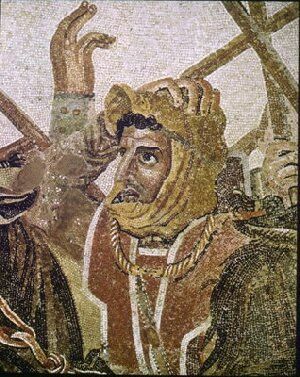 Wearing a Persian cap, is King Darius and the expression on his face is very interesting. King Darius is seen stretching out his hand to his wounded defender. There are many details which emphasize the terror and confusion of the battle, along with violence associated with war. For example, Alexander the Great, with his head uncovered, rushes forward on his horse Bucephalus. He holds a spear with which he has skewered a Persian soldier. The hapless Peresian soldier has rushed to the defense of Darius and the horse of the Persian defender of Darius collapses beneath him, while he writhes in agony on Alexander's spear. 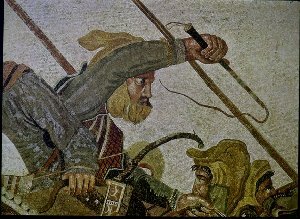 One Persian, however, to the right of the dying defender of Darius, is intent upon Alexander, and holds his sword in his hand, ready to attack. Below Darius in his chariot, another Persian soldier is staring in horror at this scene whike he attempts to hold a rearing horse. 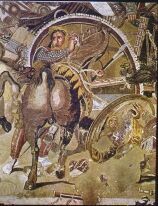 To the right, while being crushed under the wheels of Darius’ chariot is another Persian soldier. His face is reflected in the shield which he holds. 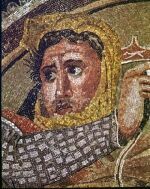 The charioteer for Darius whips the horses to flee, seeking to carry his King to safety. His expression is as determined as is his effort to escape. To the right is another unfortunate Persian defender and he is on the ground being trampled upon by the terrified horses of Darius’ chariot team. There are also other Persian soldiers, who are milling in confusion in the background with their faces filled with fear and desperation. 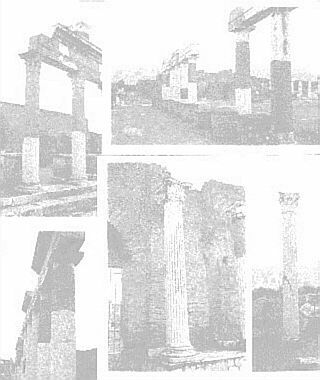 The composition of the mosaic is dominated by diagonals. The center is dominated by the intersecting diagonals of the Persian speared by Alexander and the Persian restraining the rearing horse. Two other sets of intersecting diagonals are provided by the figures of Darius and his charioteer and by Alexander and the wounded Persian. The lances in the background of the picture also carry on the diagonal motif. The setting of the battle is very stylized. In the background appears a tree with bare twisted limbs whose diagonals continue the unifying compositional motif of the mosaic. The tree also serves as a formal vertical counterweight to the Persian king and his charioteer, who rise above the battle fray. In the foreground are discarded weapons, and rocks, which serve to define the space between the viewer and the battle scene.